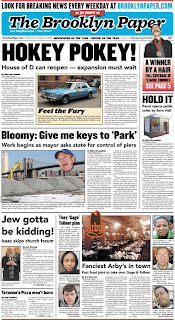 The Brooklyn Paper hasn't said all that much about its purchase by the New York Post's Community Newspaper Group (CNG) beyond a short March 12 article headlined Good buy! 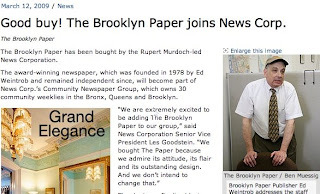 The Brooklyn Paper joins News Corp.. 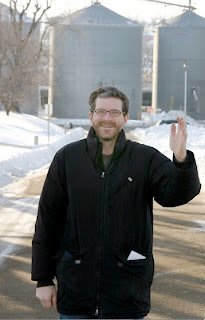 But in comments to AYR blog posts, the prolific, award-winning, self-exposing, self-referential Brooklyn Paper editor, multi-media star, and speedy author Gersh Kuntzman twice chided me for not contacting him with my questions. Kuntzman--whom I'm tempted to call Gersh, given that the Get your Gersh on headline is imprinted in my mind--indicated he may respond to my responses, as well, so stay tuned for another round. Kuntzman made the Brooklyn Paper snappy and fun, full of cleverness, while (to some critics, including me) skimping somewhat on substance. (Then again, the Suburban Newspapers of America, who made the Brooklyn Paper a 2007 "Newspaper of the Year," have especially praised the Atlantic Yards coverage.) He deserves credit for being accessible and responsive, more or less, and for helming a web site where it's easy to comment and where editors (mostly him) respond. By contrast, the Courier-Life chain has a far more opaque web site--articles get posted after publication, often with a lag, while Brooklyn Paper articles get posted mostly before publication. And who's the editor of the Courier-Life? The web site won't tell us, but the print edition lists Kenneth Brown. Still, the independence Kuntzman once touted is no longer. Compromised? At least a little. But we should keep watch. I wrote him the following questions, reproduced verbatim (except for minor changes for clarity) and interpolate his verbatim responses, then add my comments. I've reordered the questions slightly by theme. I wrote: I did, in a comment posted previously, invite your response. • The inner workings of the deal he has with the Courier-Life newspaper chain to publish his “Brooklyn! !” promotional publication. A Brooklyn Paper review discovered that publicity and printing are a huge part of Borough Hall’s discretionary budget — costs that could be a payback to the Courier-Life chain for its consistently positive coverage of Markowitz. Do you expect to make that point again editorially? GK: We will always look at Borough President Markowitz's expenditures and report on them. I can't speak to anything involving "Brooklyn!!" because I simply don't know if that business relationship will continue. And I certainly don't know what the "relationship" consists of beyond the line item in the borough president's budget. AYR: There are two parts to that answer. First, Kuntzman says "we'll cross that bridge when we come to it." 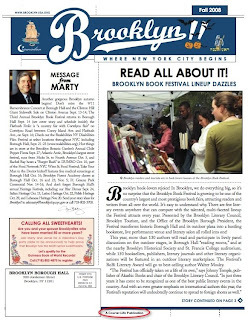 I'll note that the Spring 2009 issue of "Brooklyn!!" remains a Courier-Life publication, so it's reasonable to assume that the relationship will continue. Also, while he may not know more about the relationship, he seems to be backing off from the previous request that Markowitz explain the relationship. 2) As I've written, "I highly doubt that the Brooklyn Paper will report on political contributions by the Courier-Life publisher." Do you expect to do so? I've already posted the follow-up research. GK: I believe that coverage of CNG is best left to outsiders. Indeed, you yourself have pointed out inconsistencies when the New York Times, for example, covers business dealings of ... the New York Times. I'll answer reporters' questions when I am able, but I didn't get into the news business to cover the company I work for. If I do so, readers would be the first to scream that the story is inherently biased, no? Perhaps you can start "CNGReport.blogspot.com" to do so. AYR: As Kuntzman states, it's always difficult for newspapers to report on themselves. That doesn't mean they should ignore themselves--indeed, the New York Times does cover itself--but it generally means they won't do the most aggressive reporting. (On the Times, some of the best reporting came from Paul Moses in the Village Voice.) One solution may be to hire freelancers, as the Seattle Times once did, but, I'll admit, that's an unusual effort--and budgets are far less robust now. While Kuntzman is being somewhat flip in his challenge to me, his answer confirms that, in a "city" of 2.4 million people, the two major newspaper chains--a source of significant media power--no longer can serve as watchdogs on each other. Kuntzman said he "didn't get into the news business to cover the company I work for," and that's understandable, but when that company is a significant source of power, shouldn't there be a watchdog? Isn't that an argument for a multiplicity of voices? 3) Given that the Brooklyn Paper has occasionally taken other shots at the Courier-Life--e.g., Ariella Cohen writing about Steve Witt hugging Bruce Ratner--do you feel constrained from doing such reporting when the competition, so to speak, is now a sibling publication? AYR: So if the AY-loving Witt hugs Ratner again, someone else will have to report it. And editorialize about it. 4) Will any of the newspapers in the two chains be consolidated? If that's too soon to tell, do you think they should be? 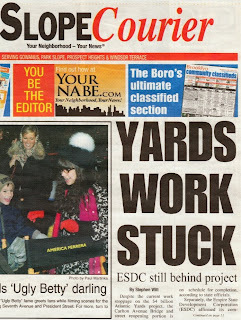 Will one newspaper and not the other end up covering Atlantic Yards? GK: I do not know. AYR: Note that he didn't give his opinion, which was prudent--and surely the decision is being made by those higher up, who, as noted below, wouldn't comment on the issue. I bet that the two chains will be consolidated, at least in part, as they start agreeing not to tread on each other's territory. However, their layouts, printing plants, and web sites are all disparate, so true consolidation might take a while. Even if the Brooklyn Paper has been covering Atlantic Yards less aggressively, it won't fall into the "brutally weird" reporting of the Courier-Life's Witt, would it? 5) Are the Brooklyn Paper chain and the Courier-Life chain completely separate right now? If not, what functions are they sharing? Do the publishers and editors of each report to a CNG editor/publisher or does the BP (or C-L) editor/publisher report to the other, or vice versa? GK: Why don't I give you the password to our alarm system, too. AYR: Kuntzman is being a little flip. While he's obviously not required to disclose the inner workings of a business, an answer like, "The Brooklyn Paper editor reports to the Courier-Life editor", or vice versa, certainly would hint at an answer to question #4. 6) As posed publicly: Will the Brooklyn Paper be distributing [Courier-Life produced advertorial] Brooklyn Tomorrow? GK: I don't know. That is a business question, which is best directed at Les Goodstein at News Corp.
AYR: I posed questions to Goodstein, via spokeswoman Suzy Halpin at Rubenstein Communications. She responded, "I am pleased to confirm the acquisition, but have no additional comment." I bet it's inevitable. And Brooklyn Tomorrow is a signal example of major newspaper publishers' willingness to curry favor with advertisers and big corporations. 7) Additionally: Will the Brooklyn Paper be involved in producing Brooklyn Tomorrow? GK: Again, I don't know. But I will say this: If I am asked to work on Brooklyn Tomorrow, I will, of course, do so in my inimitable fashion. AYR: Which means that Kuntzman, most likely, wouldn't have to write the Atlantic Yards puff piece. He might not even have to write the (fill-in-the-blank) development puff piece. He might write the funny essay about real estate. But it still won't be a comfortable position. 8) My observation is that coverage of Atlantic Yards has tailed off somewhat. (No coverage of Delia Hunley-Adossa yet, nor Forest City Ratner's lobbying, both significant stories that I broke.) Do you agree with my observation? If you do, any explanation? GK: Whether I agree with your observation or not, you have been stating it as fact around town, which disturbs me. That said, our coverage of Atlantic Yards has not "tailed off." You have provided no examples of that, save the Delia Hunley-Adossa race, which is not fully an Atlantic Yards story. It is a story about an election that is months away. Besides, Delia has not raised a DIME yet, which is typically our standard for determining whether a candidate merits coverage. Our lack of coverage of Hunley's longshot campaign should not be interpreted to mean anything — though you, no doubt, will continue to interpret to mean everything. AYR: C'mon. Hunley-Adossa, as the Times reported Friday, has raised some $4000 and gained the support of construction unions, the same people who showed up to the "Brooklyn Day" rally she MC'd last June, which the Brooklyn Paper denounced editorially as "Ratner's false choice." Beyond that, the questions I raised about her dubious nonprofit organization, Brooklyn Endeavor Experience, are worth pursuing whether or not she's a candidate. So I still contend that coverage has tailed off, though I acknowledge that some might be blamed on the paper's downsizing from three news reporters (plus Kuntzman) to two. The Brooklyn Paper has long been a mix of fun, fluff, and substance, and deciding what to cover is of course a judgment call. And a mix of stories is needed to sell ads and stay in business. However, in the past week, Kuntzman spent some of his prodigious journalistic energies on video reports on his last bites in DUMBO and covering the Greenpoint Mac Off. This is a newspaper that put Develop Don't Destroy Brooklyn spokesman Daniel Goldstein's baby (in a questionably large photo) and Forest City Ratner's Gehry born-in-Brooklyn lie on the front page. A newspaper devoted to informing Brooklynites would look more closely at Hunley-Adossa's campaign. Part of it may be resistance to crediting someone else with the story, though the Brooklyn Paper has certainly credited AYR in the past. Just look at how the Brooklyn Paper crowed about its scoop regarding the increased cost of admission to the Brooklyn Museum. Then again, I fully expect the Brooklyn Paper to cover architect Frank Gehry's "I don’t think it’s going to happen" bombshell. In other words, the 30 seconds I spend making a funny video does not indicate some sort of departure from my traditional role here. I am a multi-media legend, and I will remain one. AYR responds: I wrote "some of his prodigious journalistic energies." I don't doubt Kuntzman works hard. 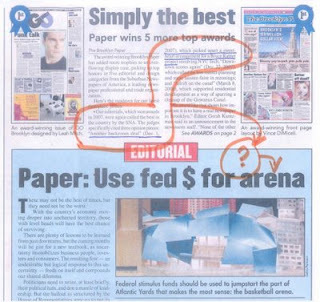 9) Do you expect coverage of and editorials regarding Atlantic Yards will change? AYR: I probably could have worded that differently, since the Brooklyn Paper's coverage has been a moving target. The Brooklyn Paper, in recent weeks, has been covering Atlantic Yards somewhat less and, as noted, I don't know how much weight to put on the simple loss of staff. Even the story on City Council member Letitia James's criticism of the AIG-to-Barclays bailout was buried on page 14, though, as noted above, stories of (I'd argue) far less import made the front page. Such comparisons are imperfect, because some weeks have more news than others, but I do detect a shift. If the Brooklyn Paper won't change from its editorial stance calling a federal bailout of the arena, that indicates a change--in emphasis if not policy--from an editorial last June calling the "Brooklyn Day" rally "democracy as they practice it in North Korea, where lackeys are paid to show up and sing paeans to the Great Leader on command." You'd think the voice behind that editorial might have something to say about the Hunley-Adossa candidacy. 10) Have you received any specific guidance from CNG regarding topics of coverage or an editorial position? To be specific, does CNG want the Brooklyn Paper to move its editorial stance on Atlantic Yards closer to that of the NY Post? GK: No one has said anything to me about the New York Post, so your question is presumptuous. AYR: Maybe somewhat presumptuous, but worth asking, especially since others have raised the question to me. Still, I'll acknowledge that the Post has kept a reasonably long leash. 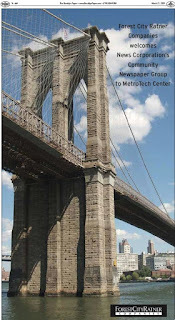 While it has distributed the Courier-Life produced advertorial Brooklyn Tomorrow, it has published harsh criticisms of the borough presidents like Markowitz, even while its subsidiary does business with Markowitz. GK: I don't see our ads before publication and I do not look at them after publication. Do you have a single example of The Brooklyn Paper skewing news coverage because of an advertisement in our paper? (Now I am pausing for dramatic effect). No, I didn't think you did. You need to ask Les Goodstein about the nature of the business arrangement with FCR (as will I). But if we are merely a renter — as we have been with Two Trees Management here in DUMBO — I believe that the current level of disclosure is sufficient. AYR: I admit that was a bit of a fat pitch. I wouldn't expect Kuntzman to have discomfort--you're supposed to shrug those things off professionally--and editors are not supposed to see ads before publication (though I don't doubt it happens with more and more newspapers and magazines). I didn't accuse the Brooklyn Paper of skewing news coverage because of advertisements, and I agree that I don't have evidence of any such pattern. 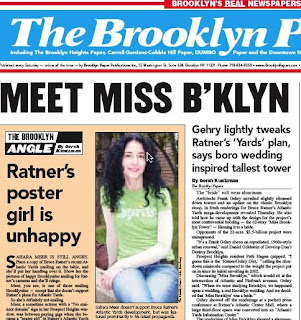 However, Forest City Ratner's advertising and publicity campaigns are news-- remember front-page news in May 2006 (right) referring to Ratner's "latest propaganda"?--so the effort by the borough's leading developer to co-opt the Brooklyn Bridge in its advertisements should be worth comment. While this is somewhat tangential, I do think that, like many other publications, the Brooklyn Paper tries to create an advertiser-friendly environment for its softer news. Its coverage of restaurants, though there are fewer reviews now, is generally positive--how many stories about health violations do we read? (Well, there was Kuntzman's slam at Peter Luger.) I don't think this is as important as coverage of government and politics, but I think it's part of running the business. Regarding the disclosure issue, others have asked me about that and I'm not sure of the guidelines. Just because the newspaper is Ratner's tenant (in "spiffy new offices," as described today) doesn't mean that business relationship--certainly more indirect than that of the New York Times Company--should be mentioned in every story about Forest City Ratner. However, it might be worth mentioning in certain articles about the Downtown Brooklyn office market.